I am so excited to announce that things are well underway with the new project which I have started in Nairobi, Kenya! In this project, I along with 4 other wind players will present three weeks of free classes, collaborations, and performances throughout Nairobi this summer! Fundraising is going well--we have had a great amount of support from family and friends through our Kickstarter campaign and donation letters. We have also received grants from the Pauls Foundation, the Peter M. Gross Foundation, and the Juilliard School Summer Grants Program. The next benefit event we will be hosting will be in my hometown of Portland, Oregon. 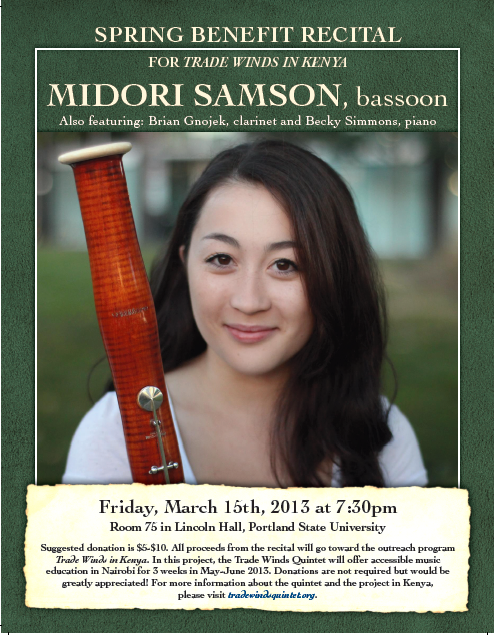 I am so excited to be presenting a recital along with my colleague, Brian Gnojek to benefit the project. Here is a poster for the event! Hope to see you there! !